As for the guys, we've got TWO to watch in the top twenty: Tadd, the hip-hop dancer we met last week, and Marko, the contemporary dancer from Guam who has a bullet in his arm. Congratulations, dudes! No eliminations this week (but get your votin' fingers ready, everyone), just some sweet sweet performances by everyone in their own styles. See Tadd's group performance here, Marko's group contemporary here, and all top ten boys right here. I have to mention the top ten girls' routine (watch here), a "creepy geisha" performance by Sonya Tayeh, one of my favorite choreographers on the show. The girls danced to "Pop Drop and Roll" by Chonique Sneed while wearing -- sigh -- kinomo-esque robes and "geisha" makeup. The song features some counting in Japanese, the routine ended with everyone bowing, and host Cat Deeley called out "Kawaii!" afterward (does she know that means "cute" and not ... I don't know, "well done" or something like that?). Over on The Voice, Dia Frampton had a strong first live show with her slowed-down version of Kanye West's "Heartless," backed by herself on piano. I thought it was a big step down in energy from the performances that preceded her, but the judges loved her melodic take on the song. 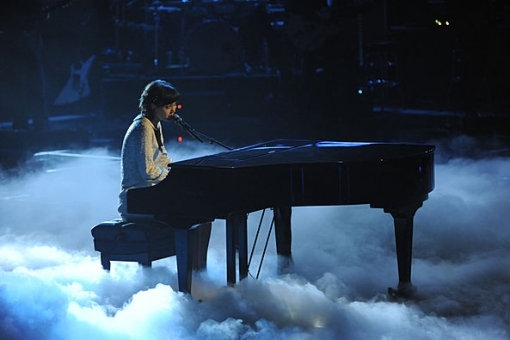 Christina said she "wasn't expecting that" and the song became "cuddly and sweet and cozy." Cee Lo called the performance "very original," adding that it was "probably the greatest rendition of the song he'd ever heard" and that he's "going to call Kanye" (better not say that "greatest rendition" line to him). Blake said that it was his very favorite moment of the show because "for the first time, America got to see what Dia Frampton does." Even Carson Daly was impressed by Dia's phrasing. The judging was on the effusive side (throughout the episode, not just for Dia), but I do think she did well, and I hope she'll be safe next week. Did you vote? There was a cute Quickfire on Top Chef Masters this week where the chefs had to instruct someone they couldn't see on how to create a dish. 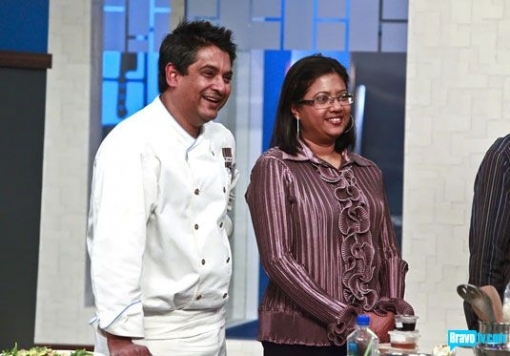 The unseen "chefs" turned out to be family members, and though Floyd recognized that his partner had an Indian accent, he couldn't identify his sister until he saw her (though ... how do you not recognize your sister's voice??). For the elimination challenge the chefs had to cook for members of the military who are coming home from overseas; Floyd created a dish for Army man Eric, and Naomi made a dish for an Air Force man from Hawaii ("What I really missed was Spam," he interviews hilariously). Eric gave Floyd a coin to show his appreciation for the meal, which had Floyd (and me) getting misty-eyed, and though once again Floyd didn't win, he's made it into next week's finale. Go, Floyd! 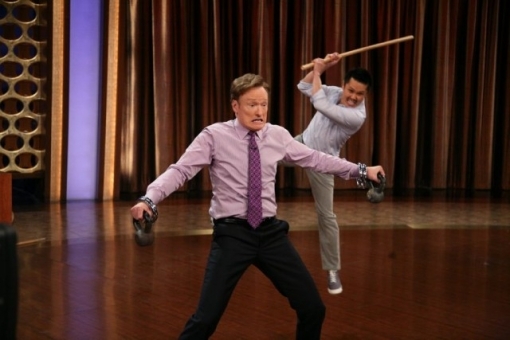 Stuntman Steven Ho was back on Conan to show the host how to channel his chi and withstand pain. If you're easily amused or still haven't figured out that thumb slide trick, it's an enjoyable ten minutes or so. Watch it here.
" What I am very tired of is the lazy shortcut of slapping some Asian-ish costumes on performers for instant "exotic" points with some vague foreign words/gestures thrown in for "authenticity." This show is so great about bringing in professionals who work in all different types of choreography; is it too much to ask for experts in traditional Asian dance instead of tossing in the rice paddy hats and "ninja running" (you know what I'm talking about: one arm bent in front, the other outstretched behind) and labeling it as "Asian" (or "geisha" or "ninja" or...)? I realize that Japanese odori is not as familiar as tap or as dynamic as, say, ballroom, but surely if there's room for that terrible Russian dance from a few seasons back..." Well put, well put! Thanks for helping me get straight in my head what was so wrong with that picture... And, I dig the title.